I first heard the great Iranian director Abbas Kiarostami (A Taste Of Cherry) espousing his ideas about how the audience "completes" his movies around the time he released The Wind Will Carry Us in 1999. That also happened to be the same year The Blair Witch Project became a cultural phenomenon. For someone weaned on Hollywood movies, the thought was heretical, especially in reference to a film as difficult as The Wind Will Carry Us: Why can't Kiarostami finish his own movie? Aren't we, as audience members, entitled to see a filmmaker's complete vision? And isn't this just a ready-made excuse for work that's half-conceived and half-executed? It didn't occur to me at the time, but Kiarostami's radical concept is the reason The Blair Witch Project became an anomaly of anomalies, a $60,000 independent film that somehow found its way onto thousands of screens and ran off with $140 million. It's also the reason some viewers left the theater flummoxed and angry over paying hard-earned money (why do those who feel ripped off always work so hard for their ill-spent dollars?) for a horror film that offers nothing more tangible than bundled twigs and piles of rocks. Directors Daniel Myrick and Eduardo Sanchez were fiendishly clever on two levels: They came up with a found-footage gimmick that flowered in people's imaginations long before they even entered the theater, and they made a movie that the audience actively participates in creating, just as Kiarostami describes it. To some, like myself, the experience of padding around the film's dark, uncertain twilight zone of a forest remains terrifying to this day; to others, it's just a bunch of twigs and rocks, and thus possibly the biggest bait-and-switch scam ever perpetrated on the American moviegoing public. In October of 1994, three student filmmakers disappeared in the woods near Burkittsville, Maryland, while shooting a documentary. A year later their footage was found. During the day, Heather, Mike, and Josh frantically search for a way out of the woods, but the map isn't getting them anywhere; worse yet, it seems like no matter what direction they choose, they wind up circling back to the same log and the same stream. At first, the guys take out their frustration on Heather, who orchestrated what was supposed to be a well-scouted hike, but never seemed to know where they were or where they were going, in spite of her protestations to the contrary. When the map goes missing, Mike (who crosses the crazy threshold first) claims to have kicked it into the river because it was useless; naturally, his mates are apoplectic, not least because they know he's right. The map won't lead them out of the woods, and neither will the compass. Shortly after they embark on their misadventure, the forest seems to close in on them, its borders still indeterminate, but its parameters somehow shrinking until they can hike all day long, then sleep in roughly the same spot they did the night before. My friend and current Esquire critic Mike D'Angelo likened this aspect of The Blair Witch Project to Sartre's No Exit, and for me, it's one of the most compelling, sophisticated aspects of the movie. It would be enough for Myrick and Sanchez to have these kids get hunted by a witch, but they instead turn the woods into an abstract place—as much a psychological landscape as a physical one. As in Sartre, the three certainly discover that "hell is other people," particularly as it relates to Heather, who shoulders much of the blame for getting them into this predicament. There really didn't need to be a witch at all, because they're so mentally frayed by the fruitless days and sleepless nights that they'd approach madness without the help of rocks and twigs. Like many of the movies featured in Cult On The Cheap Month, Blair Witch doesn't have the budget for spectacle, so it has to find other ways to take root in viewers' imaginations. In addition to the souped-up mythology, Myrick and Sanchez make exceptional use of inexpensive tools like sound and offscreen space. At night, the light at the top of the video camera reveals just enough territory to make the darkness seem all the more enveloping; on other occasions, we just hear the raw sound coming into the DAT recorder, and can only sit paralyzed with fear like our three heroes. 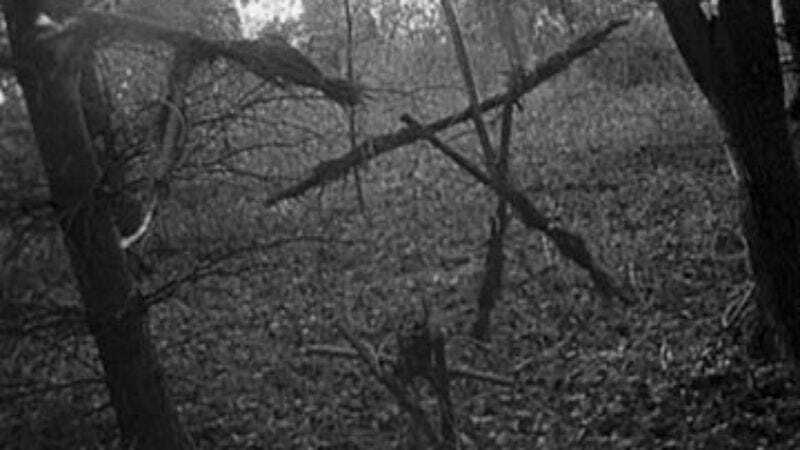 Blair Witch basically confirms a basic horror principle that's been around since the days of Val Lewton: Show little and hide everything else in shadow. Audiences are scared by the unknown, and as an added bonus, the unknown and unshown doesn't cost any money. Aside from those poor saps who hate Blair Witch for its rocks-and-twigs minimalism or its shaky-cam aesthetic (which seems quaint now that it's been brought mainstream in movies like The Bourne Ultimatum), some still can't abide Heather Donahue's performance in the lead. "Annoying" is usually the response it gets, to which I say, "And?" There's probably something to be said here about men getting bothered by women in positions of power, but I'll generously assume that people's animosity toward Heather comes from a genuine place, and isn't revealing of some deep-seated misogyny. But think about it: What does Heather do wrong here? The other guys are angry with her for getting them lost, but we know that no map or compass could have led them out of the woods. In fact, based on the evidence here, she's a competent director: They get the interviews they needed in Burkittsville proper, she brings them to one of the cemeteries and Coffin Rock, and we know that she has hiking experience and can find her way around woods that aren't, um, haunted by a 200-year-old witch. It's funny to revisit The Blair Witch Project today, since it was such a product of its particular moment in time, like leg warmers or pet rocks. There was a groundswell of buzz and hype, leading to the bizarre spectacle of a no-budget indie doing blockbuster business, and then the comedown that all movies experience once they hit video and sit on the shelf for a while. It was a movie that captured the public's imagination briefly, yet I'm not convinced it's faded entirely into the woodwork—not when faux-doc fictions like Cloverfield and the upcoming Quarantine continue to spin off its original innovation. In the cult spectrum, I'd happily file it next to Carnival Of Souls, another creepy cinematic one-off that came out of nowhere, cost nothing, and quickly deposited its makers back into obscurity.